The name Michigan comes from a Chippewan Indian word "Michigana" meaning "great or large lake" The following list of tribes and bands of American Indians who have lived in Michigan has been compiled from Hodge's Handbook of American Indians North of Mexico... and Swanton's Indian Tribes of North America. The following list of agencies that have operated or now exist in Michigan has been compiled from Hill's Office of Indian Affairs..., Hill's Guide to Records in the National Archives Relating to American Indians, and others. 1839 Mackinac, Bois Blanc & Round Is. 1860 Indians of Michigan, Index of Indians appearing in the 1860 Federal Census of Michigan; published in Michigan 1860 Federal Census Index (North Salt Lake, UT: Accelerated Indexing Systems International,n.d.) pages 420-425. Pontiac and the Indian Uprising, by H.H. Peckham, 1947. Resident of Harbor Springs, Michigan. The first 23 pages consist of a speech pertaining to the Indians of the Cheboygan and Grand Traverse area of Michigan. The paper is supplemented by copies of documents relating to Indian treaties and Indian affairs. MICHIGAN HISTORICAL REVIEW, 29:2, 41-69. [http://freepages.rootsweb.com/~trotochaud/genealogy/ "That Ignorant Frenchman- Jean Baptiste Trotochaud"
CALLOWAY, Colin G. “The End of an Era: British-Indian Relations in the Great Lakes Region after the War of 1812,” 12:2, 1-20. CASSIDY, Michelle. “‘The More Noise They Make”: Odawa and Ojibwe Encounters with American Missionaries in Northern Michigan, 1837-1871,” 38:2, 1-34. CLIFTON , James A. “ Michigan’s Indians: Tribe, Nation, Estate, Racial, Ethnic, or Special Interest Group?” 20:2, 93-152. DOHERTY, Robert. “‘We Don’t Want Them To Hold Their Hands Over Our Heads’: The Economic Strategies of the L’Anse Chippewas, 1830-1860,” 20:2, 47-70. FIXICO, Donald L. “The Alliance of the Three Fires in Trade and War, 1630-1812,” 20:2, 1-23. GENSER, Wallace. “‘Habitants,’ ‘Half-Breeds,’ and Homeless Children: Transformations in Métis and Yankee-Yorker relations in Early Michigan,” 24:1, 23-28. GILLS, Bradley J. “Navigating the Landscape of Assimilation: The Anishnabeg, the Lumber Industry, and the Failure of Federal Indian Policy in Michigan, 34:2, 57-74. GOUGH, Barry. “Michilimackinac and Prairie du Chien: Northern Anchors of British Authority in the War of 1812,” 38:1, 83-105. JUNG, Patrick J. “To Extend Fair and Impartial Justice to the Indian: Native Americans and the Additional Court of Michigan Territory, 1823-1836,” 23:2, 25-48. KARAMANSKI, Theodore J. “State Citizenship as a Tool of Indian Persistence: A Case Study of the Anishinaabeg of Michigan,” 37.2, 119-138. KERRIGAN, William. “Apples on the Border: Orchards and the Contest for the Great Lakes,” 34:1, 25-41. LEWIS, G. Malcolm. “First Nations Mapmaking in the Great Lakes Region in Intercultural Contexts: A Historical Review,” 30:2, 1-34. LEWIS, G. Malcolm. “Intracultural Mapmaking by First Nations Peoples in the Great Lakes Region: A Historical Review,” 32:1, 1-17. MCCLURKEN, James M. “Ottawa Adaptive Strategies to Indian Removal,” 12:1, 29-55. MEAD, Rebecca J. "The Kawbawgum Cases: Native Claims and the Discovery of Iron in the Upper Peninsula of Michigan." 40:2. 1-32. MIDDLETON, Richard. “Pontiac: Local Warrior or Pan-Indian Leader?” 32:2, 1-32. MUMFORD, Jeremy. “Mixed-Race Identity in a Nineteenth-Century Family: The Schoolcrafts of Sault Ste. Marie, 1824-27,” 25:1, 1-23. PEARCE, Margaret Wickens. “The Holes in the Grid: Reservation Surveys in Lower Michigan,” 30:2, 135-165. PETERS, Bernard C. “Hypocrisy on the Great Lakes Frontier: The Use of Whiskey by the Michigan Department of Indian Affairs,” 18:2, 1-13. PETERS, Bernard C. “Indian-Grave Robbing at Sault Ste. Marie, 1826,” 23:2, 49-80. PETERS, Bernard C. “John Johnston’s 1822 Description of the Lake Superior Chippewa,” 20:2, 25-46. PETERS, Bernard C. “Wa-bish-kee-pe-nas and the Chippewa Reverence for Copper,” 15:2, 47-60. PFLUG, Melissa A. “Politics of Great Lakes Indian Religion,” 18:2, 15-31. SCHENCK, Theresa. “Who Owns Sault Ste. Marie?” 28:1, 109-120. SCHWARTZ, James Z. “Taming the ‘Savagery’ of Michigan’s Indians,” 34:2, 39-55. SECUNDA, Ben. “The Road to Ruin? : ‘Civilization’ and the Origins of a ‘Michigan road Band’ of Potawatomi,” 34:1, 119-149. STEVENS, Paul L. “The Indian Diplomacy of Capt. Richard B. Lernoult, British Military Commandant of Detroit, 1774-1775,” 13:1, 47-82. TANNER, Helen Hornbeck. “Mapping the Grand Traverse Indian Country: The Contributions of Peter Dougherty,” 31:1, 45-92. TEASDALE, Guillaume. “Old Friends and New Foes: French Settlers and Indians in the Detroit River Border Region,” 38:2, 35-62. TUCKER, Patrick M. and Laurel E. Heyman. “Welcome to Hard Times: Two French Merchants and Militiamen in the Detroit River Region during the War of 1812,” 38:1, 53-81. WIDDER, Keith R. “After the Conquest: Michilimackinac, a Borderland in Transition,” 34:1, 43-61. WIDDER, Keith R. “The 1767 Maps of Robert Rogers and Jonathan Carver: A Proposal for the Establishment of the Colony of Michilimakinac,” 30:2, 35-76. The following list of Indian Schools in Michigan has been compiled from Hill's Office of Indian Affairs..., Hill's Guide to Records in the National Archives Relating to American Indians, and others. 1839 mixed-blood list It should be noted that the list with notes are published in - All our relations: Chippewa mixed bloods and the Treaty of 1837, (Theresa M. Schenck). Lantz, Raymond C. - Ottawa & Chippewa Indians of Michigan, 1870-1909. “ - Ottawa and Chippewa Indians of Michigan, 1855-1868. “ - Potawatomi Indians of Michigan, 1843 – 1904. “The Bravery of Company K”, by Elizabeth Edwards, in TRAVERSE, Northern Michigan’s Magazine, Feb. 2003, p.50. “The Chippewa Sharpshooters of Company K”, by Ted Alexander, in CIVIL WAR, Sep-Oct 1992, p.24. “Unlike the Apache, Michigan’s Ottawa Indians chose to fight for the American government, not against it” (editorial R.M. ), AMERICA'S CIVIL WAR, Jul 1996, p.6. “Into the Abyss”, by Laurence M. Hauptman, in CIVIL WAT TIMES, Feb. 1997, p.47. "Crack Shots: Michigan's Indian Marksmen Were a Constant Terror for Southern Soldiers", by Brian King, in AMERICA'S CIVIL WAR, May 2016, p.32. 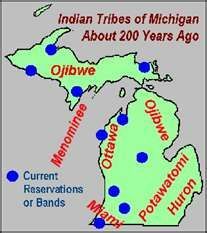 For a current reservation map -Michigan – Indian Reservations- The National Atlas of the United States of America. Federal Lands and Indian Reservations. by the U.S. Department of Interior and U.S. Geological Survey. Metis families: a genealogical compendium, (Gail Morin) [Primarily western Canadian Plains families, but some have origins back in Michigan & Quebec], 2 vls. The People who own themselves: aboriginal ethnogenesis in a Canadian family. 1660-1900 [Desjarlais family], (Heather Divine). All our relations: Chippewa mixed bloods and the Treaty of 1837, (Theresa M. Schenck). ↑ Hodge, Frederick Webb. Handbook of American Indians North of Mexico. Washington D.C.: Smithsonian Institution, Bureau of Ethnology, Bulletin #30 1907. Available online. ↑ Swanton, John R. The Indian Tribes of North America. Smithsonian Institution, Bureau of Ethnology, Bulletin #145 Available online..
↑ Isaacs. Katherine M., editor. Omni Gazetteer of the United States of America. U.S. Data Sourcebook, Volume 11 Appendices, Bureau of Indian Affairs List of American Indian Reservations, Appendix E, Indian Reservations. Omnigraphics, Inc., 1991. Clarke Historical Library, Native American Material. This library has a great deal of information about Native Americans, especially in Michigan. Some of the material is available online. Be sure to use the list on the left side to find materials. Baraga, Frederick - Chippewa Indians as Recorded by Rev. Frederick Baraga in 1847. Barce, Elmore – The Land of the Potawatomi (Google book). Barr, Charles Butler - Guide to Sources of Indian Genealogy. Bellfy, Phil – Three Fires Unity. The Anishnaabeg of the Lake Huron Borderlands. Buechner, Cecilia Bain – The Pokagons. Carpenter, Cecelia Svinth - How to Research American Indian Blood Lines: A Manual on Indian Genealogical Research. Chaput, Donald – Michigan Indians, A Way of Life Changes. Cleveland, Charles E. - Rites of Conquest: the History & Culture of Michigan's Native Americans. Clifton, James A. - The Pokagons, 1683-1983. Copway, George - Traditional History & Characteristic Sketches of the Ojibway Nation. Dawes, Charles E. – Dictionary English-Ottawa, Ottawa-English. Diedrich, Mark – Ojibway Chiefs: Portraits of Anishinaabe Leadership. Dinsmore, Dorothy Stott & Anne M. Hallock - Indian Dave's Travels: a Colorful Character. Dowd, James – Built Like a Bear, Shabni (He Has Pawed Through). Edmunds, R. David - Kinsmen Through Time: an Annotated Bibliography of Potawatomi History. Edmunds, R. David - The Potawatomi, Keepers of the Fire. Eklund, Coy – Chippewa (Ojibwa) Language Book. Faux, David K. – Understanding Ontario First Nations Genealogical Records, Sources and Case Studies. Genser, Wallace – “Habitants, Half-Breeds, and Homeless Children: Transformations in Metis and Yankee-Yorker Relations in Early Michigan”, in THE MICHIGAN HISTORICAL REVIEW, v.24, #1, Spring, 1978, pp.23-47. Gilman, Carolyn, et al. – Where Two Worlds Meet: The Great Lakes Fur Trade. Hale, Duane Kendall - Researching & Writing Tribal Histories. Hele, Karl S., editor, - Lines Drawn Upon the Water: First Nations and the Great Lakes Borders and Borderlands. Hill, Edward E. - Guide to Records in the National Archives of the United States Relating to American Indians. Hill, Edward E. - Records of the Bureau of Indian Affairs. Hulst, Cornelia Steketee – Indian Sketches, Pere Marquette and the Last of the Pottawatomie Chiefs. Ilko, John A. – An Annotated Listing of Ojibwa Chiefs. Johnson, Steven L. - Guide to American Indian Documents in the Congressional Serial Set, 1817-1899. Johnston, Basil H. - Anishinaubae Thesaurus. Jones, Peter - History of the Ojebway Indians. Kinietz, Vernon – Chippewa Village, The Story of Katikitegon. Kinietz, Vernon - The Indians of the Western Great Lakes, 1615-1760. Kirkham, E. Kay - Our Native Americans and Their Records of Genealogical Value, 2 vls. Kubiak, William J. – Great Lakes Indians, a Pictorial Guide. McClurken, James M. – Our People, Our Journey: The Little River Band of Ottawa Indians. McDonald, Daniel – Removal of the Pottawattomie Indians from Northern Indiana. Minnesota Historical Society - Chippewa & Dakota Indians: a Subject Catalog of Books, Pamphlets, Periodical Articles & Manuscripts in the Minnesota Historical Society. Murdock, George P. & Timothy O'Leary - Ethnographic Bibliography of North America, 5 vols. Murphy, Lucy Eldersveld – A Gathering of Rivers: Indians, Metis, and Mining in the Western Great Lakes, 1737-1832. National Archives & Record Service - Guide to Genealogical Research in the National Archives, see Chap. 11, p. 157, "Records of American Indians". National Archives Trust Fund - American Indians: a Select Catalog of National Archives Microfilm Publications. Nichols, John D. & Earl Nyholm – A Concise Dictionary of Minnesota Ojibwe. Peacock, Thomas & Marlene Wisun – Ojibwe Waasa Inaabidaa, We Look in All Directions. Peers, Laura, - The Ojibwa of Western Canada, 1780-1870. Rafert, Stewart - "American-Indian Genealogical Research in the Midwest: Resources and Perspectives" in the NATIONAL GENEALOGICAL SOCIETY QUARTERLY, v.76 #3, Sept. 1988, pp.212-224. Ritzenthaler, Robert E. & Pat – The Woodland Indians of the Western Great Lakes. Rhodes, Richard A. – Eastern Ojibwa-Chippewa-Ottawa Dictionary. Ruoff, A. LaVonne Brown & Donald B. Smith, editors – Life, Letters & Speeches; George Copway (Kahgegagahbowh). Schenck, Theresa M. – All Our Relations. Chippewa Mixed Bloods and the Treaty of 1837. “ - William W. Warren, The Life, Letters, and Times of an Ojibwe Leader. Schmalz, Peter S. – The Ojibwa of Southern Ontario. Schmalz, Peter S. – “The Roll of the Ojibwa in the Conquest of Southern Ontario, 1650-1751”, in ONTARIO HISTORY, v. 76, #4, Dec. 1984, pp.326-52. Sleeper-Smith, Susan – Indian Women and French Men: Rethinking Cultural Encounter in the Western Great Lakes. Smith, Donald B. - Sacred Feathers: the Reverend Peter Jones (Kahkewaquonaby) & the Mississauga Indians. Soetebier, Virginia M. – Woman of the Green Glade. The Story of an Ojibway Woman on the Great Lakes Frontier. Swierenga, Robert P. & William VanAppledorn – Old Wing Mission. Tanner, Helen Hornbeck - Atlas of Great Lakes Indian History . Tanner, Helen Hornbeck - The Ojibwas: a Critical Bibliography. US Government - LETTERS RECEIVED, 1824-1881(microfilm publication M234). US Government - REGISTERS OF LETTERS, (film M18). Vogel, Virgil J. - Indian Names in Michigan. Warren, Paula Stuart – “Native Sons and Daughters” in FAMILY TREE MAGAZINE, April 2004, v.5, #2, pp.38-43. Warren, William W. - History of the Ojibway People (aka - History of the Ojibway Nation). Weeks, George – Mem-ka-weh. Dawning of the Grand Traverse Band of Ottawa and Chippewa Indians. White, Richard - The Middle Ground: Indians, Empires & Republics in the Great Lakes Region, 1650-1815. Widder, Keith Robert – Battle for the Soul: Métis Children Encounter Evangelical Protestants at Mackinac Mission, 1823-1837.